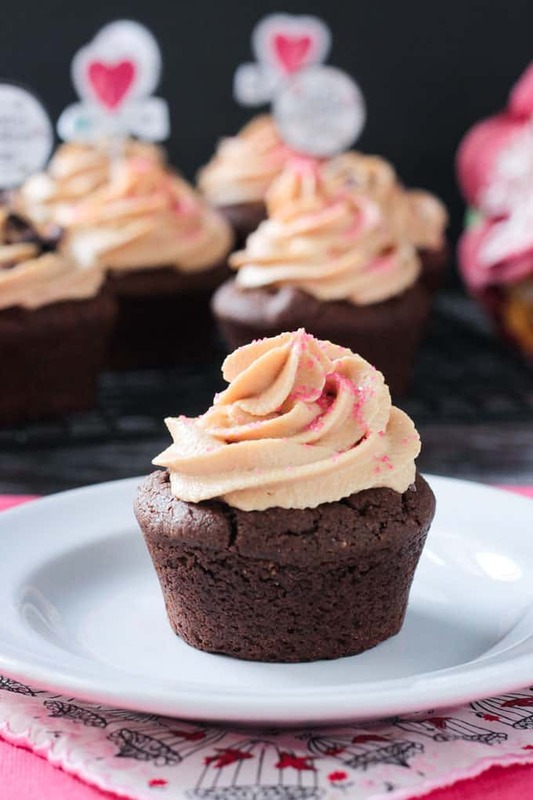 Chocolate Peanut Butter Cupcakes with Peanut Butter Frosting – Chocolate + peanut butter = Irresistible! I know of no better way to woo the one you love. Dairy free and Vegan! Just wanted to let you know that this post is sponsored by my friends at Farm Table Chef. I only recommend products that I use and love myself. All opinions are my own. When you think of Valentine’s Day what’s the first thing that comes to mind? Chocolate!! Oh, you thought it was love? Well, it is – love of chocolate….and peanut butter! 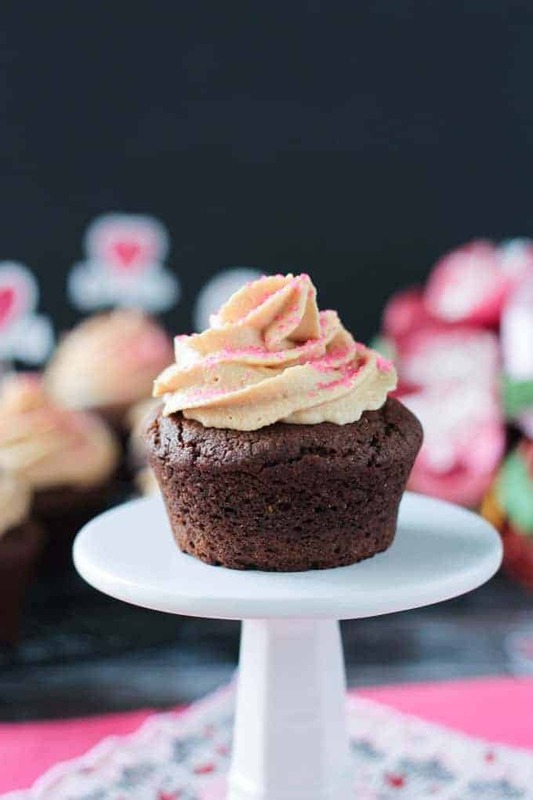 And if you really love your Valentine, you will make them these Peanut Butter Chocolate Cupcakes with the most amazing, eat-it-by-the-spoonful, light and fluffy Peanut Butter Frosting! Don’t have a Valentine? No problem – make these for yourself because you are a rockstar and you deserve it! 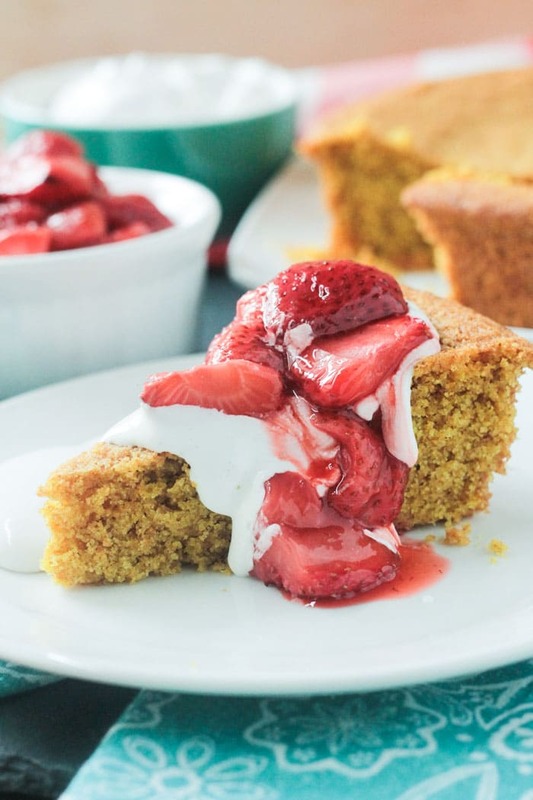 Keep reading to hear about my new favorite baking pan (it is an absolute dream to clean!) and to enter for a chance to win your own bakeware set. When the lovely people at Farm Table Chef contacted me to try out their bakeware, I knew exactly what I would be making. Chocolate Peanut Butter Cupcakes! Who doesn’t love cupcakes?! Such a yummy treat. And each one is individually packaged for ease of eating and portion control. 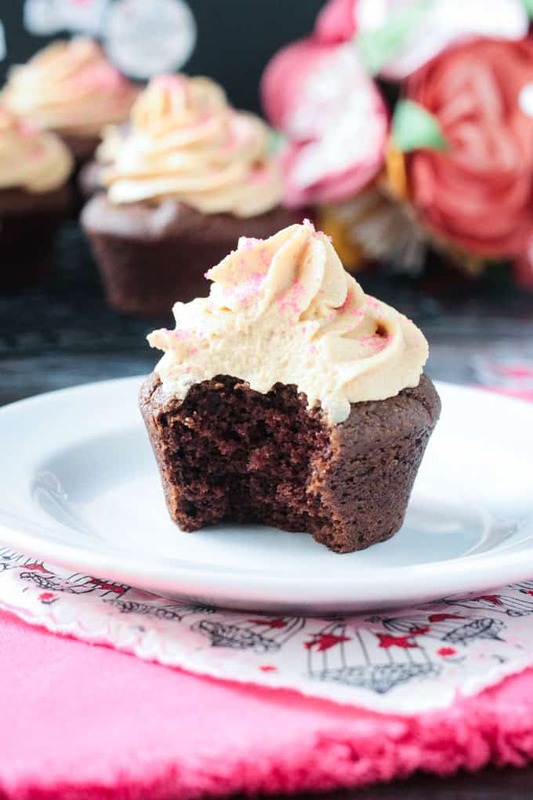 These delicious, rich, chocolatey, peanut butter cupcakes are dairy free and vegan. Yet, they bake up fluffy with a perfect cupcake crumb. The one thing I don’t like about cupcakes…cleaning the pan. Metal pans are so hard to clean. I swear no matter how much I scrub, there is always residue left behind. I always find myself scraping it out with my fingernails. Not ideal. Plus they scratch easily and get old and rusted looking pretty fast. If your metal pans are flaking, they could be leeching harsh chemicals into your food – not good! Cupcake liners don’t much help either because the baked goods stick to the liners and then crumble when tearing them off. This seems to be more of a problem with vegan, and especially oil free, baked goods…which is what I, and I’m guessing most of you, make. I’ve tried silicone bakeware in the past and I wasn’t a fan. It was so flimsy, it collapsed on itself making it hard to bake with, hard to clean, and hard to stand up in the dishwasher. And still I was digging crumbs out of the crevices with my fingernails even after cleaning them. Most silicone baking pans work better with a light spritz of oil – just like metal – which kind of defeats the purpose. I was hesitant, but hopeful about this new silicone bakeware set from Farm Table Chef. It didn’t take me long to fall in love with these baking molds and I’m certain you will love them too! They are made from high quality pure silicone that make them superior to the standard silicone baking pans on the market today. Sturdy and Durable – these pans are sturdy! Yes, they bend, but they don’t collapse and fold over completely like almost every other silicone pan on the market. 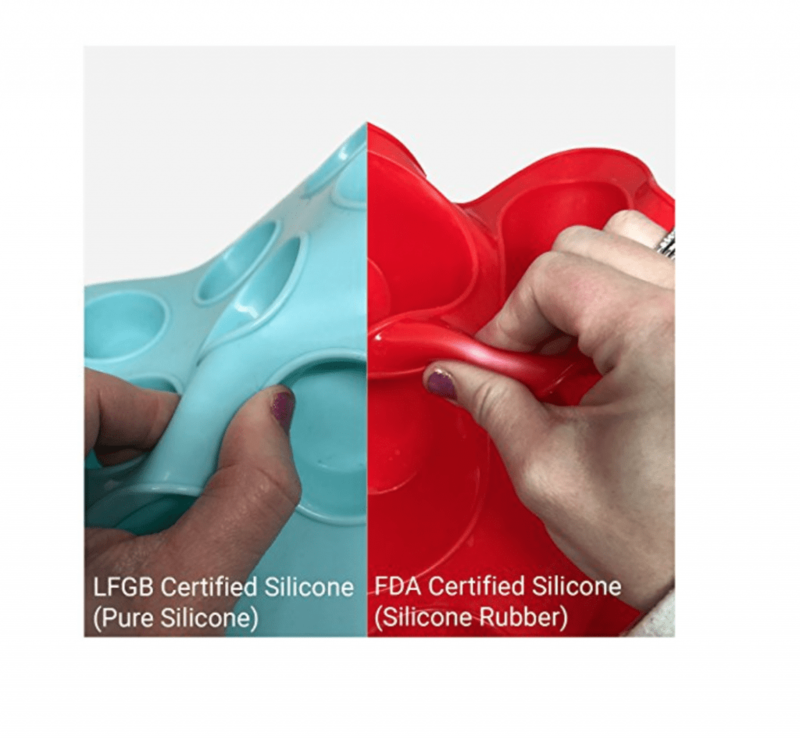 And that’s because they are a higher weight of silicone than traditional pans and they are pure silicone – no fillers! You could easily bake with them right on your oven rack without needing a baking pan for stability. Nonstick – truly non-stick. My cupcakes popped right out easily. I even tried an oil-free recipe in these pans and they slid right out. Cools down quickly – The pan cooled down so quickly, I was touching it with my bare hands just minutes after it came out of the oven. 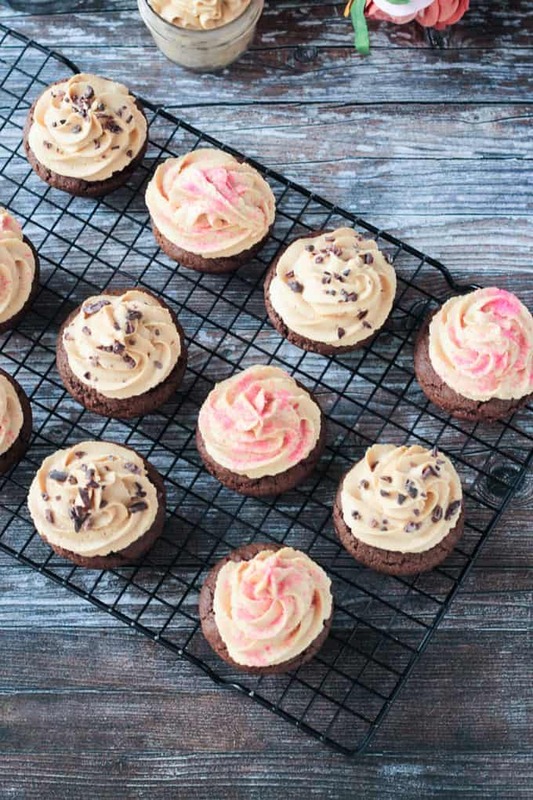 Especially great for when you have impatient little fingers around that can’t keep their hands off the treats – like these Chocolate Peanut Butter Cupcakes! Clean up is a breeze – this might be my favorite part. They practically rinse clean without any effort. I have never before had a baking pan so easy to clean. And they air dry quickly with no spotting. Complete silicone bakeware set – another bonus – you get a complete set of bakeware. 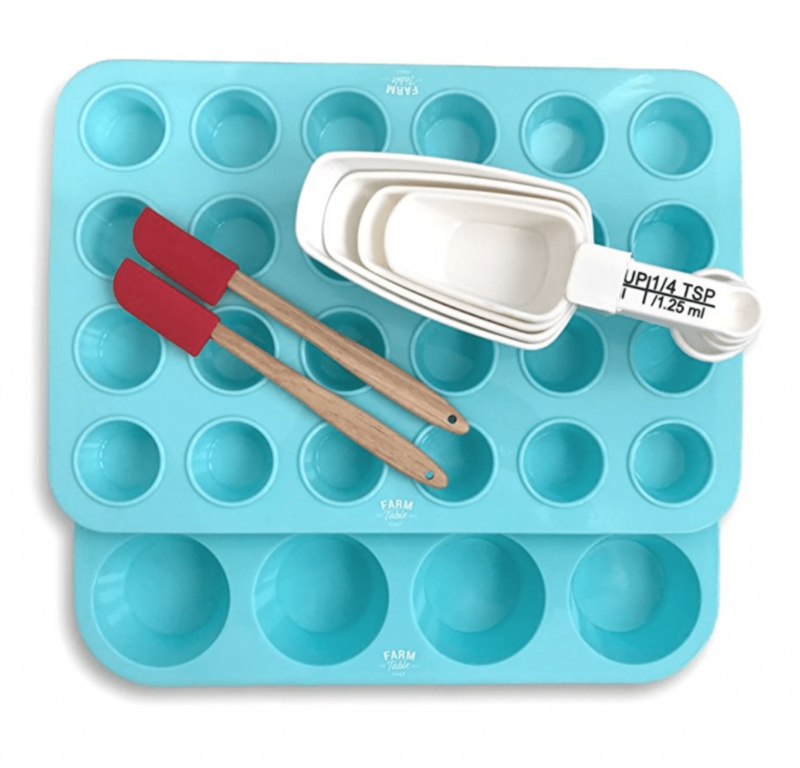 One 12-cup muffin pan, one 24-cup mini muffin pan, measuring cups/spoons, and two mini spatulas. They sell for a very reasonable price, but keep reading because I’ve got a discount code for you that will make them even more enticing! Plus a chance to win your very own bakeware set! I had a couple mishaps while testing out these pans, so I have some tips for you to ensure your cupcakes or muffins come out perfectly. Preheat your oven – obviously you need to preheat the oven with any recipe. But don’t sneak your batter in a few minutes after turning on the oven. You need to really let it heat up and come to a steady temperature. You should be doing this anyway, but it will make a bigger difference with these silicone pans if you don’t. Use a metal baking sheet underneath – Yes, I know I said these pans don’t need it for stability…and they don’t. But the metal pan will help the cupcakes bake evenly. Silicone doesn’t distribute heat like metal and I found without the pan underneath the bottoms of my cupcakes weren’t baking thoroughly, yet the tops and centers were done. This was resulting in the bottoms of the cupcakes getting stuck in the pan because they weren’t done baking! Once I added the metal baking sheet, they came out perfect every time. Let your baked goods cool – I didn’t really follow this rule so much. I let them cool in the pan for about 10 minutes and then removed them. The cupcakes weren’t completely cool and it worked fine. BUT, to ensure your treats don’t stick, you really should let them cool completely. Push up from the bottom – Give a little push underneath each cupcake cavity to pop them out of the pan. Once they rise slightly, you can grab from the top and remove them the rest of the way. After I started using the metal baking sheet underneath, I had 100% success rate of the cupcakes coming out cleanly and easily with this method. If you’ve ever been curious about baking in silicone pans or if you’ve tried standard silicone pans in the past with subpar results – you’ve gotta try Farm Table Chef’s Silicone Baking Set. It really changed my mind about baking in silicone pans. Give ’em a try and let me know how your baking turns out! Pretty in shimmering pink or dotted with cocao nibs. Which would you prefer? I say go with option C – one of each! Let’s talk about this frosting for a moment. My gosh – this frosting! This light and fluffy, dairy free, peanut butter frosting! I am not going to lie to you, it’s not low-cal, nor low-sugar, but hey, it’s a holiday. Do me a favor and eat a spoonful straight up. Preferably a big spoonful. You won’t be able to resist – promise. Don’t love chocolate? No worries. I’ve got plenty of other options for sweet treats and Valentine’s Day Desserts. Check out my Cranberry Oatmeal Crumb Bars, No Bake Raspberry Cheesecake Tarts, Rice Crispy Treats w/ Strawberries, or Cinnamon Truffles. If I’m being completely honest, these are definitely NOT going to woo my Valentine. He doesn’t like chocolate…or peanut butter (What the. What?). It actually works out just fine as that means more for me. That is, if the kids don’t eat them all first! 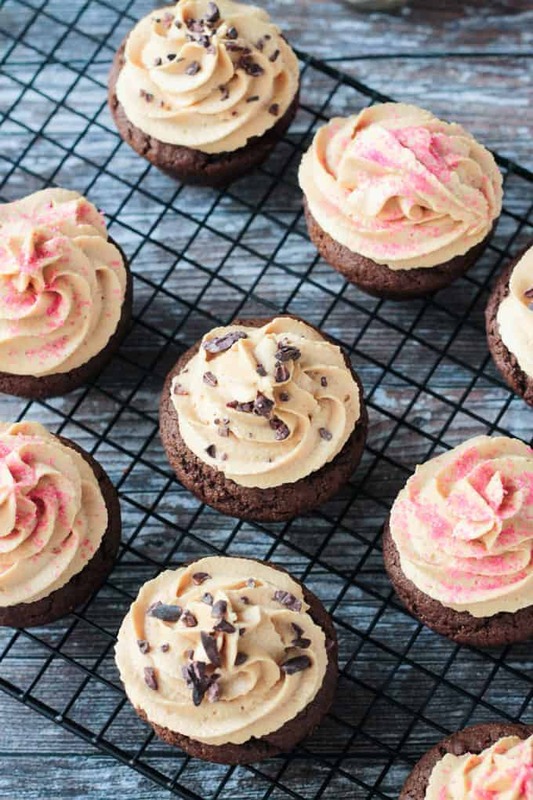 I hope you love these chocolate peanut butter cupcakes as much as we do! Please come back here after you’ve tried them and leave me a comment below with your feedback and star rating. Don’t forget to let me know if they won over your Valentine! And make sure you grab yourself a set of these amazing silicone baking pans! Order here and be sure to use my special discount code for $2 off: V2MD416J. Discount will be available until Valentine’s Day 2018. The winner of the giveaway will be notified on Valentine’s Day as well. See below for details. Alright, I gotta go eat another one of these peanut butter cupcakes. Enjoy! 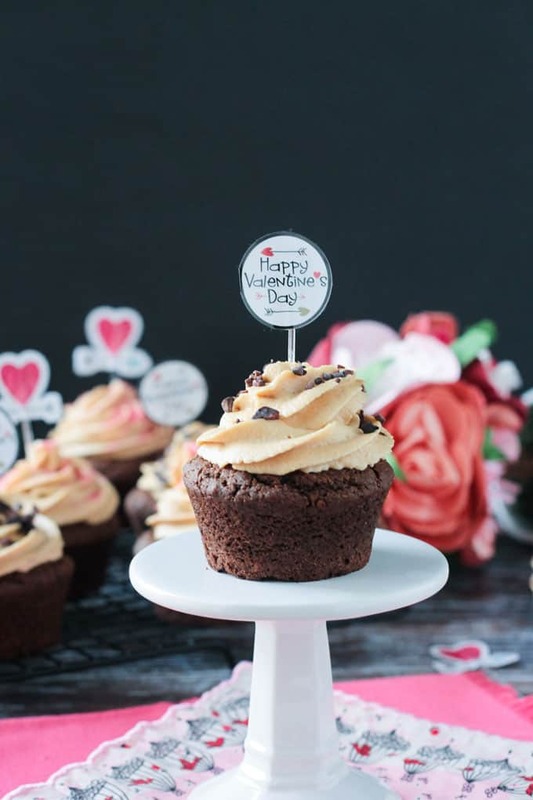 Chocolate Peanut Butter Cupcakes with Peanut Butter Frosting because THIS is the way to your Valentine's heart! Trust me, I promise! These cupcakes are light and fluffy and this frosting is like a little piece of heaven on your tongue. In a medium mixing bowl, sift the flour, cocoa powder, baking soda, baking powder and salt. Whisk until combined. In a large mixing bowl, whisk together the peanut butter, melted coconut oil, sugar, non-dairy milk, apple cider vinegar, vanilla, and espresso powder, if using, until smooth. Pour the dry into the wet while stirring until just combined. To bake using the Farm Table Chef Silicone Baking Pan (for baking directions in a metal pan, see notes): Place the 12-cavity silicone muffin pan onto a metal baking sheet. Pour the batter into the muffin pan, filling each cavity 3/4 of the way. Bake for 18-22 minutes until a toothpick inserted in the middle comes out clean. Let cool completely in the pan on a wire rack, then take the cupcakes out of the pan by pressing up under each cavity and popping them out. Once they have popped slightly out of the cavity, you can pull them gently out from the top. In the bowl of an electric mixer (or in a large bowl with a hand mixer), cream together the peanut butter, vegan butter, and powdered sugar. Add in the non-dairy milk 1 tbsp at a time until the desired consistency is reached. If it's too thin, add a little more powdered sugar. If it's too thick, add a little more milk. Once the cupcakes have completely cooled, frost them however you wish. *If baking in a metal baking pan - lightly spritz the pan with oil before filling with batter. Once baked, let the cupcakes cool in the metal pan on a wire rack for 10 minutes. Run a sharp knife around the edges of each one to make sure they are loose from the sides and lift them out. Continue to cool out of the pan on the wire rack. **If you choose to use natural peanut butter in the frosting - it will taste delicious, but will be heavier and have a more oily texture. Not as light and fluffy - so piping those perfect frosting peaks will be more difficult. ~Since the amount of frosting per cupcake can vary based on personal preference or decorating choices, nutrition facts are calculated for cupcakes alone - not frosting. Recipe and content updated January 2018. Original published February 2016. Enter to Win here! The winner will be announced on Valentine’s Day (2-15-18). If you use the discount code above to purchase your bakeware set and you are randomly selected as the winner of the giveaway, Farm Table Chef will refund your money!! <- I told you they were great! Red Velvet cupcakes are my go to Valentine’s Day treat. I’m with you on most of the fruit covered chocolate, although I do love chocolate covered strawberries. Orange and chocolate is the worst! I just can not do it. Something about the mushiness that the strawberry gets with the chocolate. Now I can say though years ago Malley’s chocolates made a chocolate covered grape and that was okay. However, again it can get mushy and it ruins it for me. Haha, yeah, mushy fruit is never a good thing! Dark chocolates are my absolute favorite. 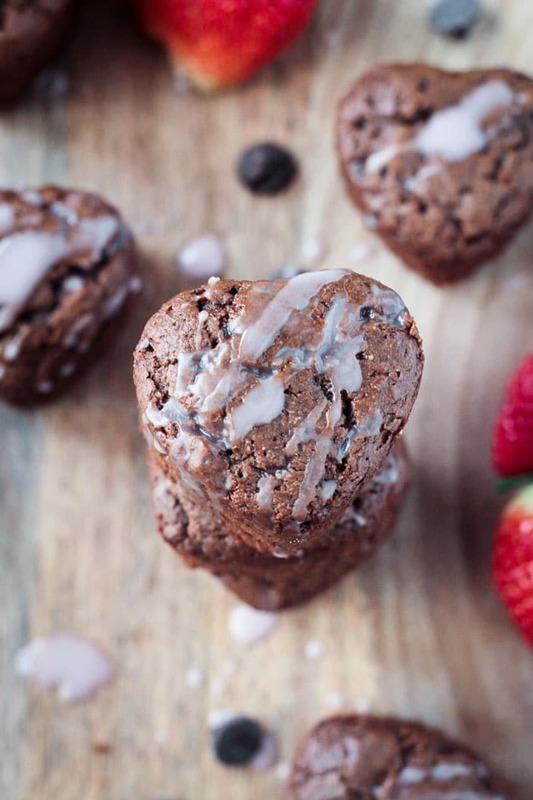 Brownies are my favorite Valentines Day treat! I hope you both love them! Let me know how they turn out! I love chocolate and strawberries the most on Valentines! That seems to be a popular choice! Yummy! They look delicious! For Valentine’s Day I love a simple dark chocolate bar. Dark chocolate is my go-to treat when my sweet tooth strikes late at night. Usually just 1-2 squares does the trick! Aahh these cupcakes might be my NEW favorite Valentine’s Day treat! Yay!! Can’t go wrong with a little chocolate on V-day!! My fave is chocolate covered strawberries! Dark chocolate with orange is my favorite VDay treat. But, oh my, I’ll have to make these for my dh and son. 😉 We all love chocolate and pb. Love to indulge with chocolate on Valentines day! These sound great! Simple squares of dark chocolate… maybe with a glass of bubbly? Oh my favorite valentine treat HAS to be dark chocolate..anything! 🙂 You’ve got some fabulous looking treats posted here that is going on my “try” list! Yum! Thanks, Julie! I am a dark chocolate fan as well! Hope you love all of these goodies! Thank you for the give away Jenn! I can’t wait to get these in the mail. I have to confess that my current metal pans are horrible and rusty. I believe my first use will be your Chocolate Peanut Butter Cupcakes. 😉 Although your Tahini Chocolate Chip Cupcakes are also pulling on my heart! You are so welcome, Julie! Thank you for entering. I hope you love them as much as I do!! Please come back and let me know how they turn out! My favorite Valentine’s treat is dark chocolate! That peanur butter frosting!! I’m going to have to try that with almond butter! Almond butter is a little runnier, so I’m not sure how that would work out, but let me know if you try it!! I love dark chocolate truffles on Valentine’s day! Creme Brulee is our special dessert! On our first date Irving ordered me a creme brulee while I was in the restroom. It was the second dessert of the night—somehow he already knew that I was the kind of girl that wouldn’t shy away from two desserts on a first date! No side salads for me! LOL!! LOVE that! And I LOVE Creme Brulee! anything with pb and chocolate is a win for me! Agree. Such an amazing combo! Thanks, Karen! Yum! Such a delightful frosting recipe, Jenn! 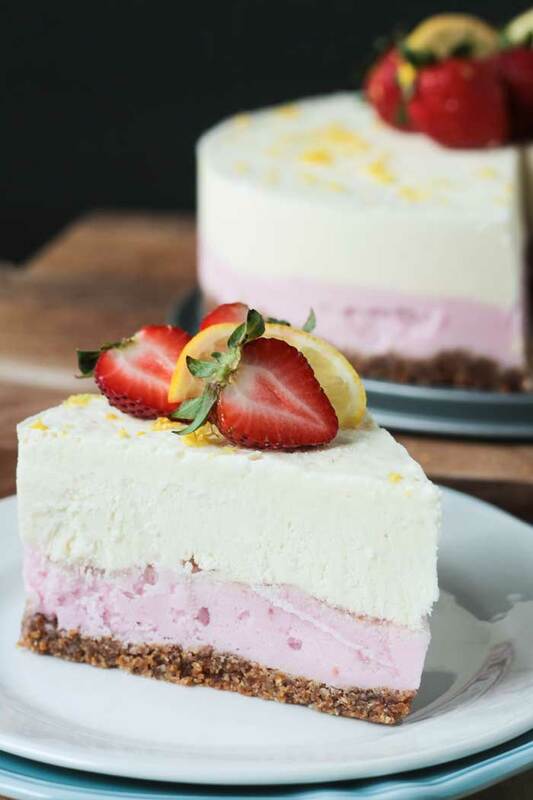 Would you recommend using coconut milk for this recipe? You certainly could! Thanks, Agness. 1. This is my very favorite cupcake combo. And 2. I’m so pumped to try these silicone baking pans! Thanks for sharing!!! Yay! I hope you love the cupcakes and the baking pans as much as I do! Don’t forget to use my code for $2 off if you decide to buy! Thanks, Lorie! I’m simply addicted to silicone bakeware! My favorite Valentine’s Day treat is homemade chocolate truffles – yum! I may have an addiction now too! 🙂 So easy to clean! And, truffles are a MUST for V-day! Your baked goods always look amazing! 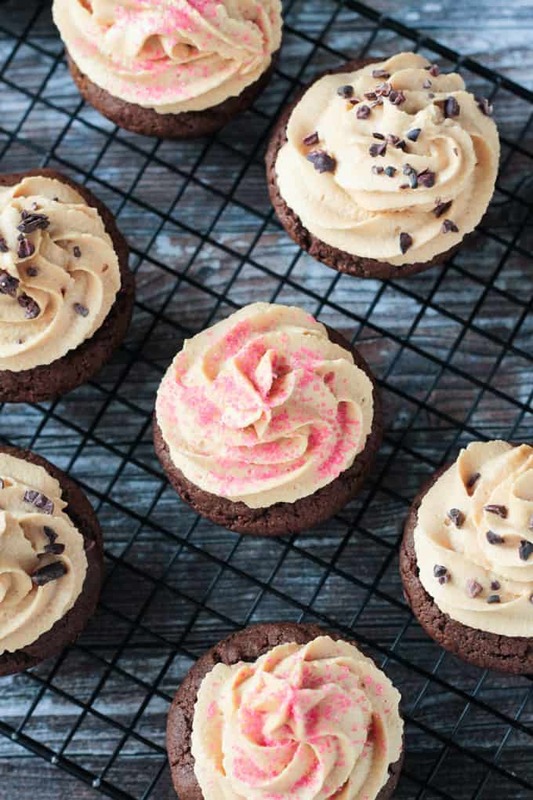 I love chocolate and peanut butter together, so I know I would love these cupcakes! It’s the best combo! Thanks, Amy! Scrubbing the pan is always the worst part about baking. And cupcake pans are the WORST! I’m telling you – these were an absolute dream to clean. Soooo easy! You won’t be sorry if you pick up a set! Thanks, Maria! I switched to the silicone awhile back and love them so much, I swear nothing sticks!! These sounds absolutely amazing from top to bottom! Thanks, Amanda! I’m a little obsessed with these new baking pans. I hate cleaning metal pans!